Bong families are known for their “Sanibar (Saturday)/Brihaspatibar (Thursday)/Mangalbar (Tuesday) er Niramish Khabar” (Veg food on a specific day of the week). Needless to say, my mother is no exception! She used to prepare Veg food on Saturdays to save me and Baba from the “Prakop” of “Sanidev” and I was there to protest to take veg food on Saturdays! However, after lots of discussions and drama Maa started taking Veg on Saturdays on behalf of us and she continues it till date. Just to praise her effort I started taking Veg on Saturdays and now I am facing the same drama in my place…History repeats itself, ain’t it! I am not a typical Bong who considers Onion, Garlic, Ginger or Masoor Daal as Non-veg and my Saturday menus are inclusive of all of them. One dish that I prefer to prepare especially on Saturdays is “Navratan Korma” because of its mild flavor. This dish is something that helps me to add lots of veggies to the palate. “Navratan Korma” is nowadays very much popular in marriages as well and the recipe that I am sharing is the typical dish that is served in Marriages, Restaurants etc. 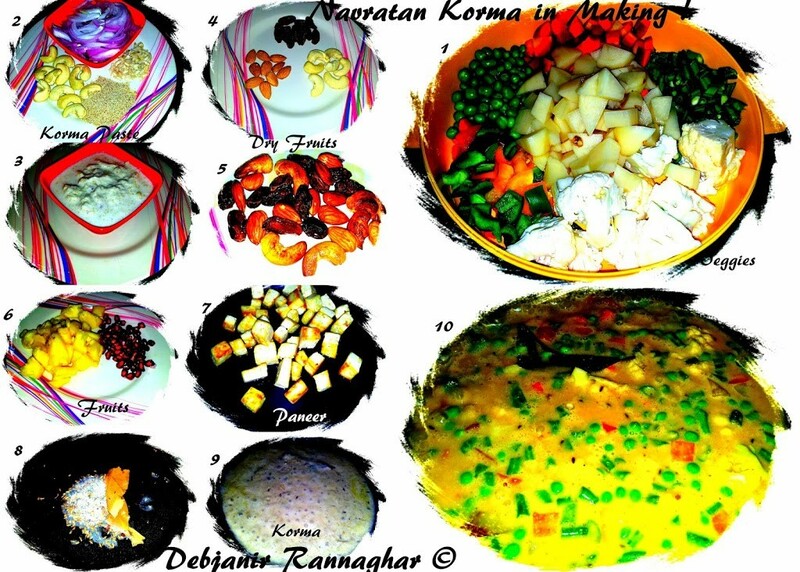 Before sharing the recipe let me share some of the details related to “Navratan Korma”. “Navratna” is a Sanskrit Word which means “Nine Gems” and is quite popular in traditional Jewellery settings in India as well as a group of “Nine Extraordinary People” from the emperors’ court of two famous rulers of India Samrat Chandragupta II and “Mughal Emperor Akbar” was known as “Navaratna”. To be precise “Navaratna” is a combination of nine elements and the dish “Navratan Korma” got its name from the “Navratna”. The authentic “Navratan Korma” should possess nine special ingredients. My nine elements are Potato, Carrot, Beans, Bell Peppers, Cauliflower, Peas, Pineapple, Pomegranate, and Paneer. Melon Seed/ Charmagaj: 1 Tbsp. Sahi Cumin Seed: ½ Tsp. Refined Vegetable Oil: 2 Tbsp. Cut Potatoes, Bell Peppers and Carrot into small dices and Beans into small diagonal pieces and finally separate the florets of the cauliflower. Finally cut Pineapple into small dices. Make a thick paste of 10 Cashew Nut, 10 Almond, Melon Seeds, Onion, Garlic and Poppy seed using 2 Tbsp. of water. Soak Saffron Strands in 2 Tbsp. of warm Milk (adding saffron is optional). Blanch Potatoes and Carrots for 5 minutes in normal water (this step is optional especially in winter). Take Oil in a Wok and heat the Oil. Fry Paneer cubes and keep them aside. Fry rest of the Dry fruits and keep them aside. Temper the Oil with Bay leaves and Sahi Jeera and then add the Paste prepared and cook for 5-7 minutes or so in medium flame till the oil comes from the mixture. Add Turmeric Powder, Salt, Sugar, and Black Pepper Powder, Garam Masala Powder and chopped Green Chilies and cook for 1-2 minutes. Add 1 Tbsp. of Water if required. Now add Potatoes, Carrots, and Beans to the mixture and cook for 5 minutes and then add Cauliflower, Peas and lastly Bell Peppers and Pineapples. Add fried Paneer and fried Dry fruits. Then add Cream and Saffron mixed milk to the mixture and cover the pan with a lid and cook until all the veggies cooked proportionately. This should take around 7-10 minutes in medium flame. Check the consistency as well as check the gravy for spices and if required adjust spices. Add 1 Tbsp. of Ghee and Switch the flame off and give the dish a stand of 5 minutes. 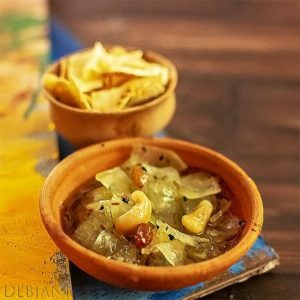 Garnish the “Navaratan Korma” with Pomegranate seeds and fried dry fruits. “Navaratan Korma” is ready to serve. I prefer to serve it with homemade Paratha or Peas Pulao.